When It Starts To Go . . . .
Home /Urbanism/Uncategorized/When It Starts To Go . . . .
. . . . It REALLY starts to go. And now it’s moving fast. Janette Sadik-Khan, former New York City Transportation commissioner, will be speaking in Vancouver on March 22 at the Vancouver Playhouse (in part with Gordon Price) while promoting her new book “Streetfight: Handbook for an Urban Revolution”. In this article in NY Magazine, she traces her history and her personal experiences during installation of bike lanes there. It’s pretty clear that New Yorkers have sharper tongues and elbows than we Vancouverites. But in both places the streetfights have been just as bitter. There may have been a more practical explanation for the end of the media frenzy: The polls started coming in. A Quinnipiac University poll found that 54 percent of New Yorkers said that bike lanes were “a good thing.” This was the first of many polls that would be released in the coming months, two putting bike lanes’ popularity as high as 66 percent — higher than the approval numbers for the politicians who railed against the lanes. Meanwhile, here in Vancouver, I’ve been thinking along similar lines. Those with long (if capricious) memories like mine may recall our ancient history. Ten years ago, no respectable person would speak the word “bicycle” in polite company, and separated infrastructure (a.k.a. a bike lane) was a distant fantasy. The press gleefully published bicycle-related hit pieces, and open-line broadcasters reached new lows in divisive fulminating rhetoric. But oh my, how things have changed. For example, I am elated at the Arbutus Greenway announcement, which will create a 9 km long bike facility (design pending) from Marpole to False Creek — a major north-south bikeway, bike route, greenway — whatever you call it. In earlier times, it might have become condos, strip malls and parking lots. But not now, when the place of the bicycle in the transportation mix has been re-affirmed at the ballot box. As in New York, we have seen a head-snapping turnaround in the public conversation here about bikey stuff. Strong positivity in some strong places, and benign indifference in others, has replaced near-universal negativity. Granted, a few cranks continue to whale away at discredited negative tropes, but they are fading fast into a tiny minority, and are really only found now in online comment sections and smoke-filled partisan back rooms. These changes, and the Arbutus Greenway, prompted me to list big wonderful bikey things that have happened recently, or are in the works. It’s an impressive list. Not every item is all about bikes, but big bike stuff is a big part of all of them. The message is really clear. They’re all about change. And it’s really starting to change fast. Protecting the bike lane with parked cars (as per Richards St) requires an additional buffer between the bike lane and the parked cars. Reportedly, there wasn’t sufficient room on King Edward to include that feature, so the bike lane is in the door zone. Not sure what would have had to be taken out on King Edward to create that additional space for a greatly improved cycling facility. I agree fully. There is totally enough room there to have AAA facilities on each side. Take a bit from the meridian, narrow the general travel lanes, remove the parking on the sides and there you go. Even if they had done part of it between two cycle routes, Balaclava and Valley Drive it would have been very useful. It’s a missed opportunity that maybe could be corrected someday. Now with the Arbutus corridor going to be a greenway, people will want to get to it from the west or to the west from it. I’m not disagreeing with you Stephen, just reporting what the engineering team advised. I have heard lots of support for better protection on those bikeways, and HUB Cycling has an upcoming assessment ride on that route. I will make sure to read your blog post first. Working for NYCDOT before and after Sadik-Khan was night and day with respect to cycling, pedestrian, and complete streets initiatives. Her predecessor, Iris Weinschall, saw DOT’s mandate as moving cars and throwing the occasional bone to transit. Under Jeanette, we had free reign to rethink how streets served all road users and the authority to deliver those changes – so long as we had done our homework. It sounds cliche now, but it was a completely different approach at the time: delivering streets with people other than motorists in single occupant vehicles in mind. Thankfully she had the solid support of Mayor Bloomberg. If he’d caved whenever outer-borough NYers complained to the media, Jeanette would not have lasted long, gotten much done, written a book, or be invited to speak very often. They worked well together and it was fun to be a small part of it. 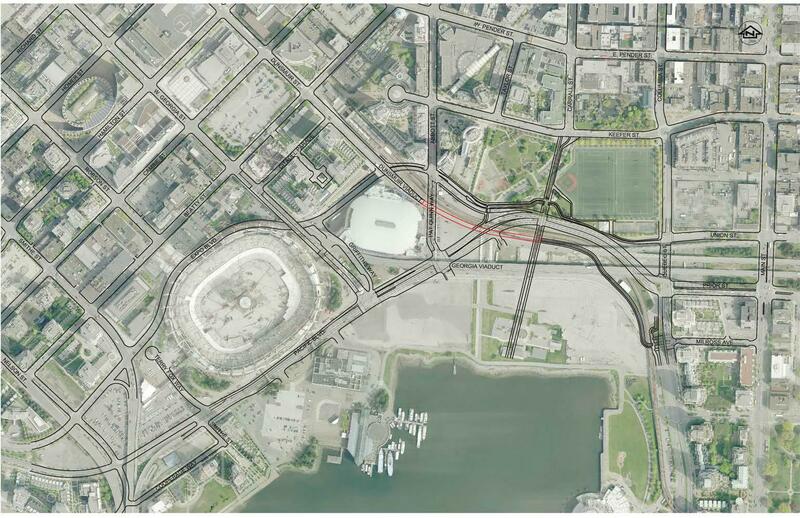 “active bridge for bikes” (associated with Quebec St and the Viaduct) … what’s this one? When the viaducts come down, a connection will be required from below the escarpment, around the new Creekside park (with connections to Union, Ontario, Central Valley Greenway) to the Dunsmuir separated lanes. The proposal is for a pedestrian and cycling bridge, much lighter than the viaducts, that runs from around the foot of Carrall (near the Concord sales office) to Dunsmuir. Because it will consolidate the bike traffic from three major routes into downtown, it will have higher volumes than the current viaduct bikeway (which only connects to Union). Other cycling improvements include separated lanes on Pacific, a lane on the new Georgia ramp, and the connections to existing bike routes referenced above, with a separated bike route on Quebec. That will take some of the volume away from the seaside path in front of Science World, for commuters. Makes me want to go out and buy a bike! Maybe being “bad” or “good” depends on how lumpy or smooth one looks in cyclist fashion Lycra. Me, I prefer street clothes. Not that I’m overly lumpy. Or smooth. That’s so great. There goes my only reason for opposing the viaduct teardown. The design is really good if you really study it. A new park along the water. Increased motor vehicle capacity. The active transportation bridge. Removal of a structure that wasn’t designed for earthquakes. The other cool thing is that if you get stuck in traffic you’ll be able to use a side street to get away instead of being trapped like now. That’s cool. Perhaps one day they will consider a separate ped + cycle bridge across the Creek too. The ped/cycling bridge proposal was floated as an alternative to providing decent cycling on the Burrard Bridge, which is much better for connections to downtown since there is little elevation drop on the north side. Luckily, council persevered on the Burrard option. Cycling upgrades to Granville Bridge and Cambie Bridge will be coming soon. How about a direct walking/cycling connection between the Granville Bridge and the Arbutus Corridor. How awesome would that be? I was thinking of one a little further east, perhaps connecting to the Laurel land bridge and Charleson Park and swinging over to land near the ferry dock or courts in David Lam Park. I don’t think you’d need a 15m bridge deck. Ideally, 8m (5 for bikes, 3 for peds), or even 6m (a 4/2 split). The south end of the Granville Bridge connected to the close by Arbutus Corridor would be the easiest, hands down, but would miss the recreational cyclists and pedestrians on the False Creek seawall. The bridge – 5th Ave connection would also be considered should a tram line be proposed for Arbutus. But I feel that amenity should branch down to the False Creek RR corridor and then to Gastown and ultimately Stanley Park via Cordova. I’d forgotten about that … thanks for the reminder. Ken – great article. Lots of great stuff happening. I agree with Mayor Robertson that the Arbutus Corridor is a once in a generation type of major opportunity and promises to be a significant legacy from our current council. Tipping points happen very quickly. The first Burrard Bridge bike lane trial was abandoned within a week in 1996. The second attempt was approved near the end of one council term and quickly reversed by the newly elected council Third attempt was 2009 and one of the first decisions made by the new Vision dominated council. The media and opponents predicted the end of the world as we knew it. News Helicopters, huge media coverage. By the evening it was a non-story because traffic was not affected. The Point Grey Road decision was the most controversial decision faced by council since the 2008 election with council hearings going on for 3 evenings. Now people love it. By contrast, the latest decision to upgrade the northbound curb lane to cycling, returning the sidewalk to pedestrians and a massive safety upgrade to Burrard/Pacific attracted only 5 speakers, most of whom were opposed to the proposed suicide prevention barriers. Charles Gauthier of the DVBIA was one of the first to offer support and stated that this is what the business community needed. The Sun had a very positive article – How could anyone oppose such a great plan? The tipping point for acceptance of cycling has arrived in the City of Vancouver. Hopefully this will spread to other municipalities and across Canada. Can’t wait for the grand opening of the Arbutus Corridor Greenway in 2017 – the 150th anniversary of Canada. The news tends to go in trends so they’re working on developing another enemy but they also are heavily influenced by their advertisers (which include many from the automotive and related industries). Another factor is that some years ago the traditional auto makers were worried about the post peak-car era but now with cheap gas and their new competitors being electric car makers they’ve shifted the focus of attack. They also have some hope to sell self-driving cars to prop up their sales. Gas won’t stay cheap forever. Passionate, dedicated people were talking ‘bicycle’ and ‘separated infrastructure’ 10 years ago here in Vancouver and I remember it being an exciting conversation to be having at the time. The Carrall Street Greenway was first brought to open house in 2003 if you can believe it. Most likely the city’s first real separated on-street route, too, unless you count the block long section of Victoria between Broadway and 10th (I don’t). But I do agree, the rhetoric has changed significantly from inflammatory ‘war on cars’ style reporting with serious bias, to conversations about the bigger picture — livability in our cities. On the street and on my bike, however, I don’t see much change in behaviour. Our bikeways need serious traffic-calming measures, right now they act as short cuts for motorists. And it still seems socially acceptable for motorists to yell at people on bikes for any variety of reasons, with an acceleration and cut off being the usual end statement. This is especially true on Vancouver’s neighbourhood bikeways. A family with children on a bike route riding within the law do not warrant obscenities or aggression directed towards them for simply being there. And yet, this occurs far too frequently. The bicycle happens to factor strongly in creating complete streets and increasing the pleasure of city living, for all citizens, and therefore the public perception of ‘bicycles as nuisance’ is slowly changing as it becomes clear they are part of a solution. Exciting times, yes, but with plenty of room for improvement yet to come. JSK is an inspiring leader in this, and one to listen to. It’s obvious we need more separated bike routes, especially across the city. One small step toward improvement and safety, though, would be to improve the barricades to limit traffic on some routes like Ontario to bikes + local traffic only, with exceptions near commercial retail. The goal is to make Ontario and Union/Adanac routes AAA (All ages and abilities). This requires reducing motor vehicle volumes. At a minimum, it should be a goal to keep volumes on all residential bike routes at least below volumes on parallel residential streets. Totally agree. Traffic on crossings may be difficult, but I find the circles do work most of the time to slowing the traffic down. Still needs work though. Agreed. These small traffic-calming / reducing measures can actually make quite a difference in day to day riding. I am also in favour of a law making it illegal to pass a cyclist on a neighbourhood bikeway…further reducing the appeal to drive on these 30km/h routes. And check this out from Toronto. They’re doing a trial of bike lanes on Bloor St. It’s been over a decade at least being worked on and finally they’re going to try it out. The response has been more neutral from the press than it would have been five years ago. I haven’t heard of any death threats either. I like how a city staff member said “It’s nice to be talking about design…”. if you read the article in NY Magazine, she talks about how the news media lied to the people about the plans, what the fire department said, etc.. She gives many examples. Why are they allowed to get away with that? Shouldn’t they get fined for lying or something? Isn’t there something like journalistic integrity they have to go by? Great article! Vancouver has done so much to improve cycling infrastructure, and it’s worthwhile to celebrate the successes. I didn’t realize how good I had it cycling in Vancouver until I moved to Burnaby and started to ride downtown to work. Out here, car culture dominates, and mode share for bicycles only is 0.9%. Cyclists are so infrequent that it doesn’t even occur to drivers (or pedestrians) that there might be bikes on the road or crossing intersections on the infamous ‘urban trail.’ This city isn’t a safe place to ride, even for experienced folks. A great opportunity to point out that HUB Cycling has ten volunteer action committees covering many local municipalities, including Burnaby. These groups are working to improve cycling conditions, and get more people cycling, more often. Interested readers can visit bikehub.ca to get more info on the local committee in their area. All are welcome.